(Bloomberg Opinion) -- Activist investor Dan Loeb is having a second crack at Sony Corp.
His Third Point LLC is building a stake in the Japanese electronics and entertainment conglomerate, with a view to pushing for change, Reuters reported, citing sources it didn’t name. Shareholders loved the news, driving the company’s Tokyo shares up as much as 7.4 percent Tuesday morning after its U.S. ADRs climbed as much as 9 percent overnight. Loeb is becoming a regular feature in Japanese shareholder tables. Fanuc Corp., Suzuki Motor Corp., and 7-eleven operator Seven & i Holdings Co. have all found their way onto the hedge fund founder’s hit list. Evidence of Loeb’s impact could be seen in leaked correspondence after Sony was hacked. The chief financial officer at the time, Kenichiro Yoshida, told Sony’s top U.S. executive Michael Lynton that cuts were coming, and that the American unit – which housed the U.S. games, electronics and entertainment businesses – wasn’t making enough money. In the end, the then CEO Kazuo Hirai pledged $250 million in cost cuts at the unit over the subsequent two years. 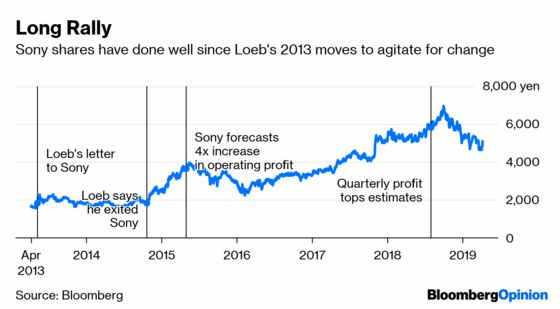 Loeb exited Sony around 18 months after first building his stake, with a handsome 20 percent return on the investment. 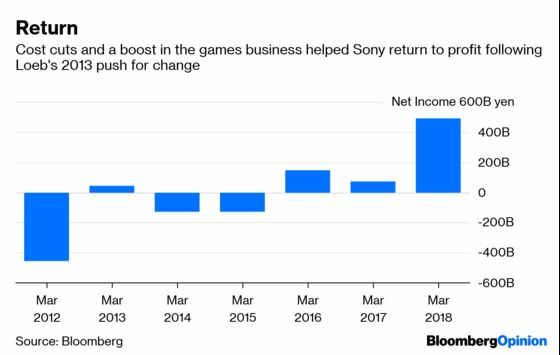 After two years of losses, Sony went on to post three years of profit, including record net income in the year to March 31, 2018. Its shares also staged two impressive rallies, climbing as much as fourfold over the next five years. But now Sony’s shares are weak again, having dropped by as much as one-third from a September high, before news of the Loeb redux. At the same time Kaz, who stepped down as CEO a year ago, will quit as chairman in June this year. Yoshida has since been promoted to CEO. Reading the various exchanges between Third Point and Sony in the past, it appears to me that Loeb is actually quite fond of Kaz, with his activism at Sony not being a personal attack on the long-time executive. Loeb’s opinion of the management at Sony’s U.S. film and TV unit appears somewhat dimmer. This makes the renewed push by Third Point well-timed. According to Reuters, the hedge fund once again wants Sony to look at the possibility of selling some units, with the U.S. movie studio supposedly attracting takeover interest from new-era media giants like Amazon.com Inc. and Netflix Inc.
I’m still pretty skeptical about the rumors of this outside interest, which may just serve Loeb’s purpose in trying to get Sony to at least think about selling. But there’s a deeper point here anyway: The U.S. division, and some other units, are prime Sony assets that aren’t being fully exploited. Squeezing any more value out of them at all would offer upside to investors. Shareholders should maybe anticipate smaller changes, then, and not only a big dramatic move like a spinoff. As the last round of Third Point v. Sony showed, Loeb doesn’t need to hit the ball out of the park to score a victory.